If you are a comedian, comic magician, clown, or street performer chances are at some point in your career you were interested in Slapstick. At some point you saw the fall-down humor of Jerry Lewis, Charlie Chaplain, The Three Stooges, Jim Carrey, or Zach Galifianakis and wanted to learn how to do that. If that time is now, you found the right DVD! 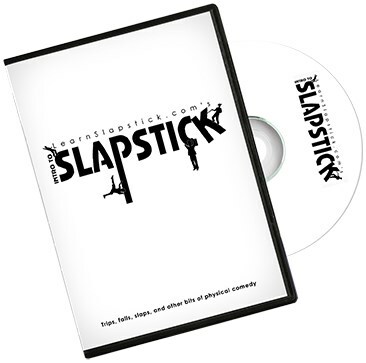 This Intro to Slapstick Video is an instructional DVD that will teach you everything you need to safely become physically funny! THERE IS NOTHING LIKE THIS IN THE WORLD! This is the only DVD that brings the secrets of slapstick comedy directly to you with clear, step-by-step instructions. How to safely perform Funny Falls. How to perform safe and silly Slaps. The answer is simple, people love slapstick comedy. It is funny in every language and children as well as adults laugh at slapstick humor. How does it get better than that? How much is that worth to a performer? Whether you are a magician or comedian, whether you perform for children or adults, whether you perform locally or internationally there is something for you on this DVD. So what are you waiting for? Get the DVD and Get physically funny!